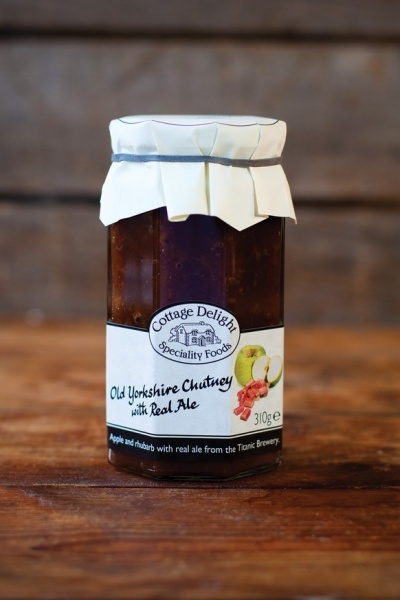 Cottage Delight's Gold Taste Award Winner Old Yorkshire Chutney with Real Ale is a truly traditional chutney. A Great Taste Award Winner, Old Yorkshire Chutney with Real Ale is made using Bramley apples and rhubarb with Real Ale from the Titanic Brewery in Staffordshire. This deliciously deep and rich flavoured chutney is delightful with strong cheeses and cold meats. Try Old Yorkshire Chutney with Real Ale with a traditional pork pie or home made sausage rolls. INGREDIENTS: Bramley apple (22%), Demerara sugar, Rhubarb (11%), Malt vinegar (from Barley), Muscovado sugar, Gelling agent: Pectin, Sultanas, Dried onion flakes, Real ale (2%) (Contains Wheat malt), Cider, Salt, Mustard seed, Spices, Garlic powder.